Life, in Pictures. Buy at Amazon. An intimate self-portrait of the American icon Will Eisner, and a chronicle of the career that launched a new art form. 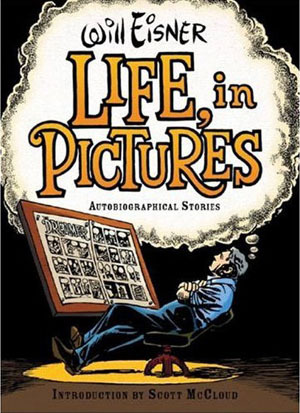 In what will be the closest thing Eisner fans will see to an autobiography, the great master and pioneer of American graphic arts presents the most intimate and personal perspective yet on his life as a writer, a professional, and an artist. This hard cover collection features three complete Eisner graphic novel classics: The Dreamer and To the Heart of the Storm describe Eisner's gritty early life and career, while The Name of the Game chronicles a personal history of his wife's family. Finally, two shorter pieces illuminate the bookends of a legendary career: "The Day I Became a Professional" -- which will appeal to any hopeful young artist -- describes Eisner's first rejection from a potential publisher, and "A Sunset in Sunshine City" provides a poignant portrait of Eisner in old age. 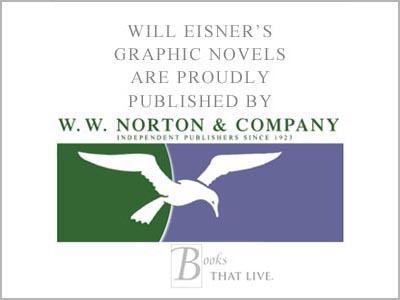 The book features famous characters from the world of comics (under pseudonyms, of course) and other historical figures and family members, all drawn with Eisner's characteristic mastery and technique.